You may not know it but you may be guiding your son or daughter into part time work and poverty. You may be guiding them into irrelevance. There is nothing more discouraging, disheartening than working hard and discovering that all that work has made you irrelevant. Make your kids irrelevant and the result will be that they will still be basement rats when you are being carted away in a hearse. There is nothing more dangerous or destructive than irrelevance. When I was a boy, the busiest place in town was the blacksmith shop. I used to go there with my father. The blacksmith and his assistant had the coals white hot, sparks showered from the horseshoe or anchor that he was making. Jobs waiting to be done were piled up. Harrows, discs, wagon wheels, all needing repair. Farmers and fishermen coming and going, dropping off items, picking up others. There was the smell of the coal and the steam as red hot iron was plunged into cold water. The blacksmith was so essential that nearly every town had at least one. There was lots of warning. Automobiles of various kinds by many different companies were being built during the 1800s. However, they weren’t seen as a threat to horse transportation because of the lack of roads, the difficulty of buying fuel, and the frequent breakdowns. The Model-T appeared but horses and blacksmiths continued to be necessary.The beginning of the end for thousands, tens of thousands, of blacksmiths, those valued members of society, those earners of decent incomes, had begun. Blacksmith shops closed their doors. What was needed now were mechanics. 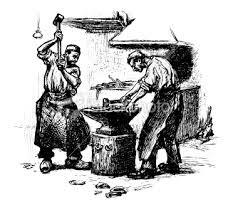 Today, we only see blacksmiths at country fairs where the craft is practiced as a nostalgic hobby. Employment comes with having knowledge and skill that other people want and need. At one time that was the ability to shoe a horse. See how many jobs that will get you nowadays. Life and innovation creep up on you, make you irrelevant, leave you with skills for which no one wants to pay. Writing, for example. When I was twenty, I decided I wanted to be a writer. I wanted to write fiction, journalism, drama. Hemingway, I’d read, was both fiction writer and journalist, and was earning a dollar a word. One or two stories would take him to Europe where he could go to the bullfights and drink wine and have adventures. No one pointed out that I was following the path of the blacksmiths. No one knew that that path to irrelevance ,TV, already existed. We watched it but it never occurred to me or anyone else I knew that the ads on TV were going to strip magazines of their advertising. The magazines were the lifeblood of freelance writers. Articles and stories for popular and trade magazines paid the bills. Companies quickly realized that they were buying eyes for their ads and the eyes were now locked onto TV screens. Then computers came along. I was involved in computers when only nerdy professors and military types used them. We learned code. We figured out ways to make margins line up. We went from a main frame and a printer that took up an entire basement in a university building to the PC. Publishing radically changed. The skills that were being taught to editors and printers became irrelevant, were replaced. One PC was the equivalent to a small publisher. Jobs disappeared. Those laboring in the print offices became the new blacksmiths—irrelevant. University is not trade school. Universities exist to educate. The link of university education to getting a job is tenuous. It may be non-existent. If you don’t want your son or daughter to follow the blacksmiths to oblivion, you need to help them choose a career for the future. If it is a trade, it needs to be a trade that will be relevant until they retire. If it is an education, you need to look ahead to how it will help them earn a living. Doctor, lawyer, dentist are direct. History in Art, musicology, pottery, modern poetry, not so much. Those don’t even get you started as a blacksmith. When I taught Creative Writing over a period of thirty six years, I always emphasized that students should take a double major. The creative writing gave them skills and the other major gave them a specialty to write about. When the Co-op program started, I encouraged everyone to take part. There are jobs in communications in both private and public areas. The future has no certainty to it. Change will occur. The unexpected will happen. Ultimately, your son or daughter will have or not have a good financial life by having knowledge and skills that others need or want. Need is better than want. In hard times, wants disappear. Tell your kids about the fate of blacksmiths. Have conversations with them about the future. If they want to be a musician, artist, poet, actor, help them see that also developing knowledge and skills that are needed is like having a lifeboat. Professional athletes often hedge their bets with educations that provide employment and income after the no longer can play football, hockey, basketball, etc. Ask your kids what jobs exist that people need? Ask them which jobs they think will be relevant ten, twenty, thirty years from now? Which of these jobs do they want to do? Then discuss what they need to do to get those jobs. Or, they can be a greeter at Walmart when they are their parents’ or grandparents’ ages. Tell them to look at those greeters, or the older people handing out flyers at Home Depot, or people in their fifties, sixties, seventies, doing minimum wage jobs when other people the same age are comfortably retired or, if still working, are making substantial amounts o money doing a job they want to do. One doctor I know is still going in to read X-rays two days a week. He’s needed. His skills are wanted, needed and well paid. An editor I know retired and is now making over a hundred dollars an hour doing specialized editing. In one hour, these people make more than those people earning minimum wage in an eight hour day.